Nearly everyone takes some time to create a beautiful lawn and garden. The landscape may be filled with plants and trees of all types. It can include everything from rose bushes to zinnias and daffodils to majestic trees that provide protection from the sun and wind. 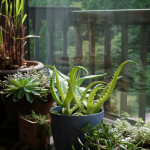 But have you ever considered making the interior of your home greener and more plant-friendly? Even a single eco-centerpiece can add a feeling of life to a space. Rather than using artificial plants and flowers to create a centerpiece, you can use the real thing. Anyone with a creative flair can choose from a variety of natural options to add interest to a room. Indoor terrariums are a great way to display your enthusiasm for growing plants. Terrariums are inexpensive and fun to make. To begin, you will need a large jar or other glass container. Add some rocks or other drainage material to the bottom. Next you will add your potting soil and plants. The final step is adding decorative accessories to the miniature landscape. Another way to bring the outdoors in is to add fresh cut flowers to vases and other containers. Ordering Vermont Wildflower seeds will ensure a great selection of fresh flowers to choose from. These seeds will quickly grow into luscious flower-producing plants. A single vase of fresh flowers makes a pretty centerpiece for a table or other piece of furniture. However, if you really want to create a green look in a space you can take that concept much further. When it comes to attractive centerpieces more is better. Why not add more than one vase of fresh flowers to your dining room table? One tip though, to add interest to your display you should use an odd number of elements. Most people use 3 or 5 elements in each shelf or tabletop display that they create. In this way, a typical centerpiece can become the focal point of the room. The color and beauty of the display demands attention; it is where eyes will land when entering the room. Besides tabletop displays you can add an unexpected element of surprise with plants and flowers. If you have an appropriate space you can create a walkway of flowers and plants in your home. Consider adding displays to shelves that line the walls along a hallway area or other passageway. This can give the space a vibrant atmosphere. Another idea is to create a windowsill garden. You can find shelving units made for this purpose. Whether you choose to grow flowers, herbs or other plants you will definitely appreciate the green additions to your home. Incorporating a natural décor scheme can help create a fresh look that can make your home feel like spring and summer all year long. Plants and flowers in the home make the space feel calm and relaxing while also giving it a sense of liveliness. It’s the ideal way to decorate your home.